Before the Renaissance and the Medicis, Florence was not the undisputed cultural and economic capital of Tuscany. Siena flourished from the late 13th to the mid-14th centuries, constructing striking Gothic buildings that are still copied today, nurturing the Sienese school of painting that produced famed Gothic artists like Duccio, and endeavouring to build one of the largest cathedrals in all of Italy. The outbreak of the plague in 1348, which more than halved the city’s population, ended Siena’s glory days. A series of outside rulers kept the city’s previously ambitious leading council in check, culminating in the city’s 1555 defeat by Holy Roman Emperor Charles V, which effectively banished the city to economic dormancy. A Tuscan Sleeping Beauty, Siena’s medieval architecture and traditions remained frozen and preserved almost entirely unchanged for the next four centuries. 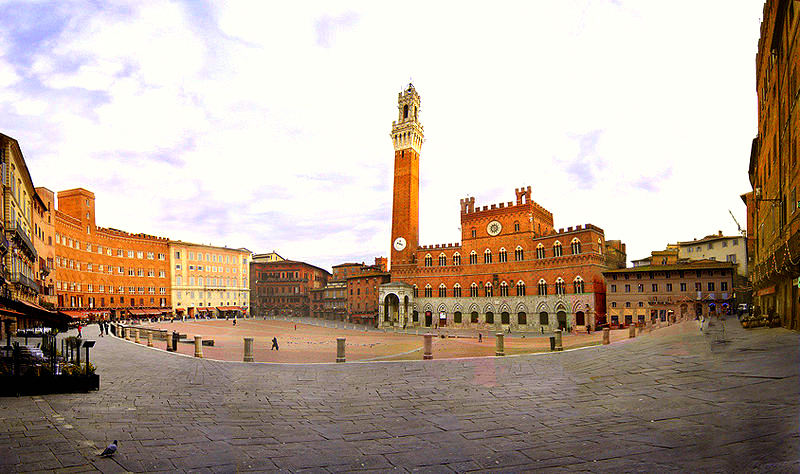 Buses to Siena from Florence and San Gimignano arrive in Piazza Gramsci inside the city walls. If you arrive in Siena by train—either changing to the local line from Rome at Chiusi or from Florence at Empoli—get a local bus ticket in the station café for the 8,9, or 10 into Piazza Gramsci or walk the winding uphill sidewalk route through the 20th-century urban sprawl. From Gramsci, walk uphill toward the city centre on Viale Frederico Tozzi and continue on Viale Curtalone when the road veers right at Piazza Matteotti. The towering sand-coloured exterior of Chiesa di San Domenico, a Gothic church dating back to 1226, looms at the end of the road. Santa Caterina, Siena’s patron saint who received visions and the stigmata at a young age, took her vows here in the Cappella delle Volte, and the only portrait of her painted during her lifetime is kept above the chapel’s alter. Frescoes by Sodoma depicting scenes from the saint’s life adorn St. Caterina’s Chapel, along with several relics—desiccated pieces of her body. Follow Via Camporegio back to the Costa di Sant’Antonio to see the Casa di Santa Caterina, filled with frescoes of the saint by Sodoma, and to make a lunch reservation at La Chiacchera (39-0577-280-631), a small restaurant with outdoor tables that serves fresh, inexpensive local specialties. Continue straight up Via della Galluzza toward the Campo, but turn right at the covered street Via di Diacceto to go the Duomo. Begun in 1196, it has some elements of Romanesque architecture, but it us one of the foremost examples of Italian Gothic style. Many of the cathedral’s most notable decorative elements, including the octagonal marble pulpit carved with scenes from the Life of Christ by Nicola Pisano and the carved wooden doors on the main entrance, date to the late 13th century. The lower section of the striped façade featuring statues of philosophers and prophets was completed by Nicola’s son, Giovanni Pisano, near the end of the 14th century. Fifty-six floor panels of inlaid marble narrating biblical and historical scenes, created between the mid-14th and 16th centuries, are the cathedral’s most prized feature and only shown to the public during a few weeks in the summer. Off the north aisle, a door leads to the Library of Piccolomini (Pope Pius II), which contains his personal book collection and a series of vivid frescoes depicting Piccolomini’s life by Bernardino Pinturicchio. 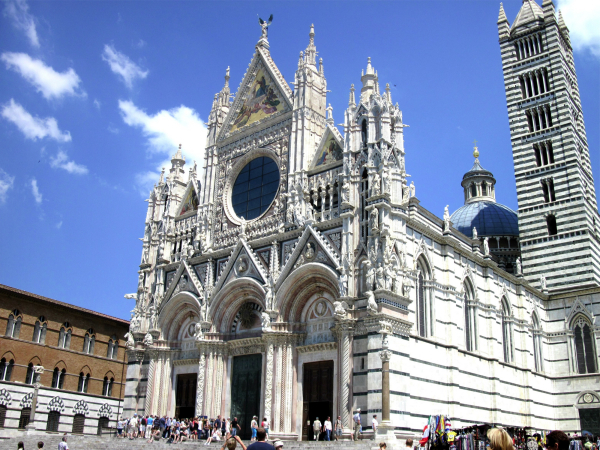 In 1339, during the height of Siena’s prominence and wealth, city leaders embarked on an ambitious plan to build a new nave and create one of the largest cathedrals in Italy. The plague, which hit the city in 1348 and killed more than 50,000 Sienese citizens, put an end to the grand plan, but the skeleton of the expansion remains. Climb the 131 steps of the corkscrew stairway along the façade of the “Nuovo Duomo” for an expansive view of the city. The southern aisle of the Nuovo Duomo has been enclosed and turned into the Museo dell’Opera Metropolitana (Museum of Metropolitan Artwork), containing Duccio’s striking Passion and Maestà and Pisano’s original sculptures from the cathedral’s façade. From the Duomo, return to La Chiacchera for lunch or grab a picnic spread at Pizzicheria de Miccoli on Via di Città and follow the road into Siena’s famous Piazza del Campo. 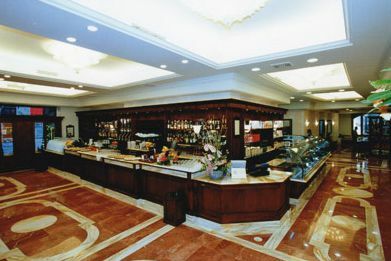 Take Via del Castoro from the Piazza del Duomo and turn left onto Via di Città to reach the Pizzicheria. The sharply sloping expanse of Il Campo is divided into nine sections to represent the Council of Nine who commissioned it in the mid-14th century. Today, it’s an ideal place for a picnic, drink, or mid-day nap, but for centuries, it has served as a crucial civic space for the Sienese, as the Palazzo Pubblico (Town Hall) is located at the low end of the plaza. Enter the ground-floor courtyard and head to the Museo Civico, home to Ambrogio Lorenzetti’s Allegoies of Good and Bad Government, a series of frescoes revealing much about the nature of government in Medieval Siena, and the first known work of Simone Martini, his Maesta dating to 1315, in the Sala del Mappamondo. Head back to the courtyard and wait your turn—only a handful of people are allowed up at once—to venture up the 102-meter-high Torre del Mangia for expansive views of the Tuscan countryside. Laze in the Campo until you recover from your trip up the tower and then exit the northernmost route out of the plaza via Banchi di Sopra street, a main shopping artery lined with local handicrafts. Stop in for a coffee and a snack at number 22, Nannini, (39-0577-30301) a Sienese institution that has been turning out sweets like Siena’s signature panforte—a dense spiced cake made from honey, ground almonds, and dried fruit studded with nut slivers—and ricciarelli—light, fluffy cookies made from ground almonds, orange peel, and honey—since 1911. Continuing down Banchi di Sopra back to the bus stop at Piazza Gramsci, you’ll pass Piazza Salimbeni on your right, home to the head office of the Monte dei Paschi di Siena bank. Founded in 1472, the bank is the largest employer in the city, a remnant of the city’s medieval glory. Twice each year, on the 2nd of July and the 16th of August, the city also revives its medieval traditions for Il Palio, a minute-long wild horse race between the city’s districts that has captivated the thousands of locals and visitors who crowd into the Campo each year since 1656. If you hang around the Campo the days before the event, you can catch the riders trying out.